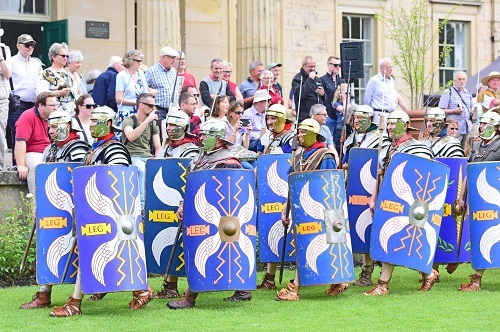 The sights, sounds and smells of Roman Eboracum came to life in the beautiful grounds of York Museum Gardens. 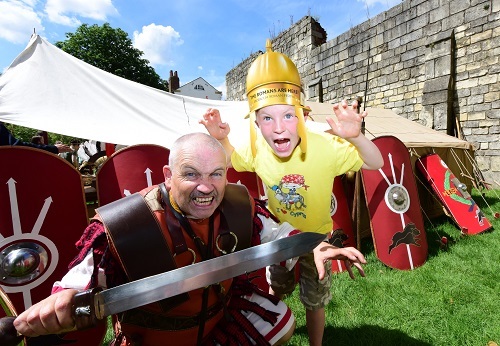 Alongside fighting displays and a Roman Living History camp showing domestic life, children met Roman soldiers and took part in army drills. 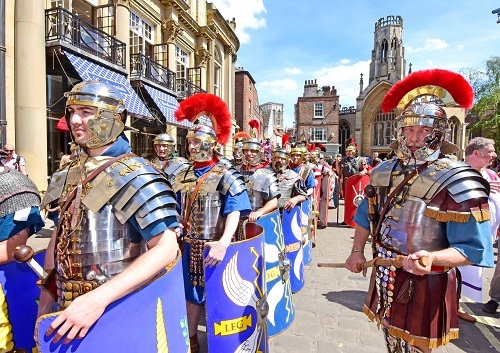 On Saturday and Sunday, we had the Roman Parades as six Roman Legions and Roman civilians marched through the streets of York. Click here to view the festival leaflet online. 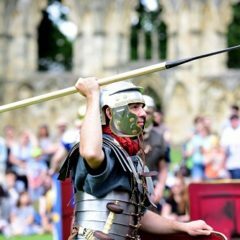 Join Dr Peter Addyman CBE for a one hour conversation with Graham Harris (Roman Bath Museum) as they discuss Romans, York and archaeology. 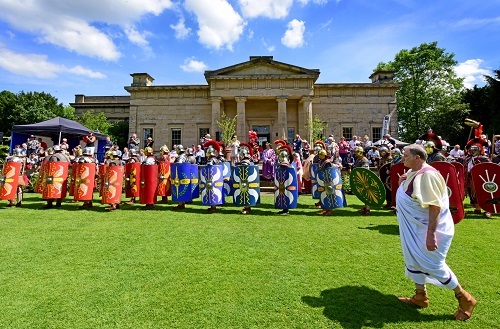 From 7pm take the opportunity to talk to the Yorkshire Museum curators as they display Roman objects that are not normally in the exhibitions. £5, click here to book. 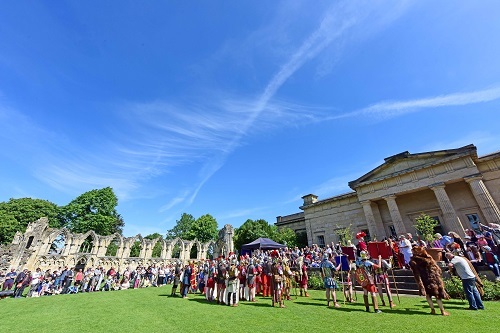 Tickets can also be purchased from the Yorkshire Museum. 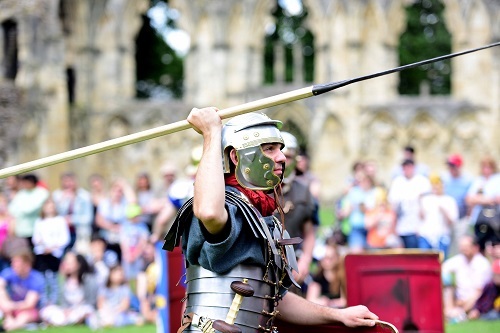 Discover how and where the Romans buried their dead in, or rather outside, Roman York. 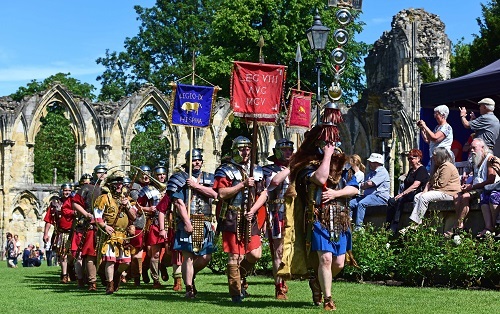 On this walk led by expert Kurt Hunter-Mann you’ll visit some of York’s most interesting Roman cemeteries, find out about the evidence recovered from each place and how it tells the story about the topography of Roman York. This event has now SOLD OUT. 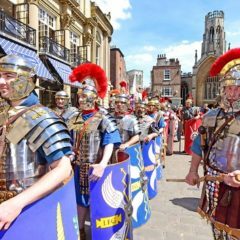 On Saturday and Sunday, come and see a spectacular sight as six Roman Legions and Roman civilians march through the centre of the historic city of York. 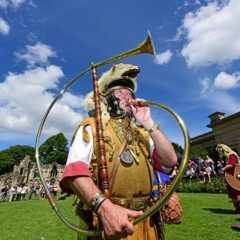 The route each day will start from York Museum Gardens and the march will go via Lendal, St Helen’s Square, Davygate, Church Street, Petergate, Deangate, York Minster, Duncombe Place, Blake Street and Lendal. Free, no need to book. 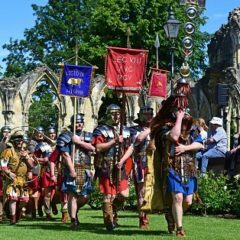 Roman Eboracum comes to life in the York Museum Gardens! 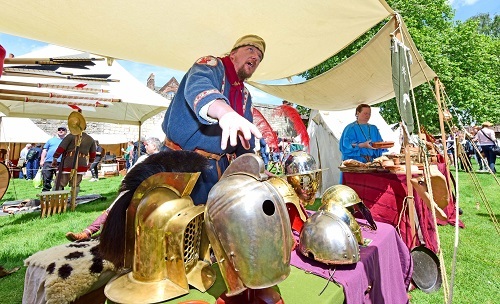 Meet the Legionary soldiers and their families in a colourful tented encampment, and visit the many stalls to learn about Roman weapons, armour, lifestyle, beliefs, food and much, much more. Free, no need to book. 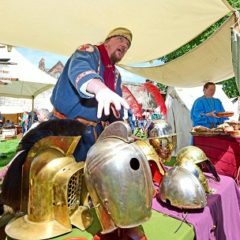 Head into the cellars with your guide to discover the archaeology below our feet and see where Harry Martindale saw the Roman ghosts literally walking through the wall. Tours will take place on 2 and 3 June at 11.30am, 12 noon, 1.15pm, 2.15pm and 3.30pm (approx. 30 minutes each). Suitable for ages 5+, charges apply. Click here for more information and to book ahead. The dux Britanniarum was the General responsible for the frontier units of northern Britannia. But what do we know about this office? Was he based at York, as is often assumed? 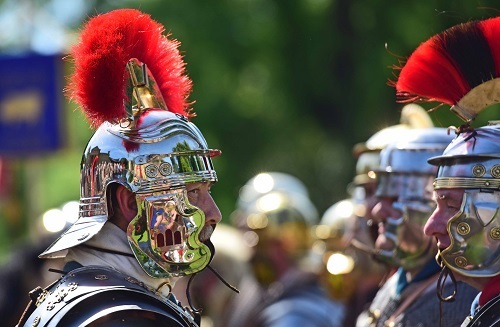 This talk will consider the evidence for the office of this powerful late Roman general. 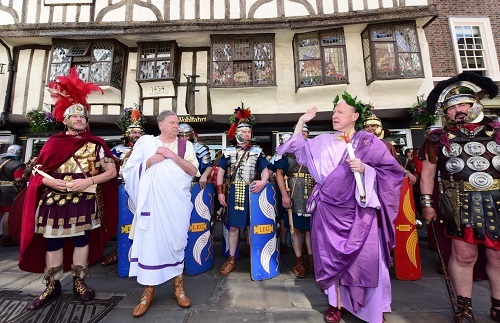 The Roman period was the first in Britain to leave a written record, giving us the names of individuals. 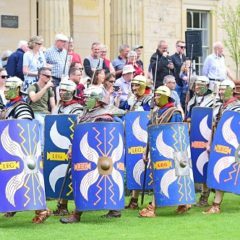 In the Yorkshire Museum there are a number of inscriptions which mention women in particular and by exploring what these tell us, both textually and pictorially, we can gain some insight into life and death in Roman York. Nowadays we have water at the turn of a tap and light by the flick of a switch. 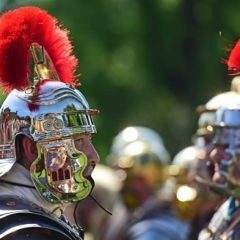 How did the Romans get water, light their houses, heat rooms, wash dishes or get rid of their rubbish? 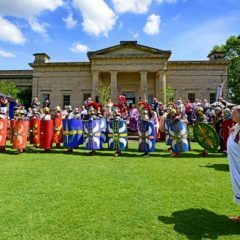 This talk looks at the real everyday life of a Roman. Take part in a range of archaeological activities with professional archaeologists. 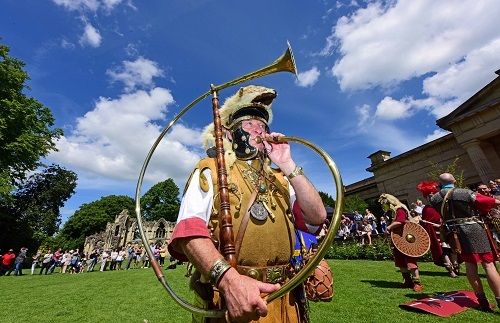 With stands provided by West Yorkshire Archaeology Service, the Council for British Archaeology and the Young Archaeologists, enjoy activities and find information about what is archaeology, some of the tools and techniques that are used and see examples of what you might find. 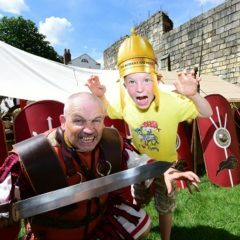 Enjoy fantastic family-friendly activities at the Yorkshire Museum including storytelling, sword and shield drill, kids curator’s talks, Museum Monkeys specials, and much more! 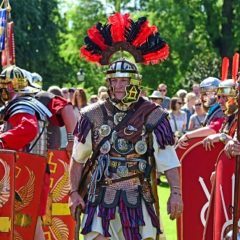 Under 17s always get free entry at our museum, and adults can receive a 20% discount on admission over the weekend with an Eboracum Roman Festival leaflet. 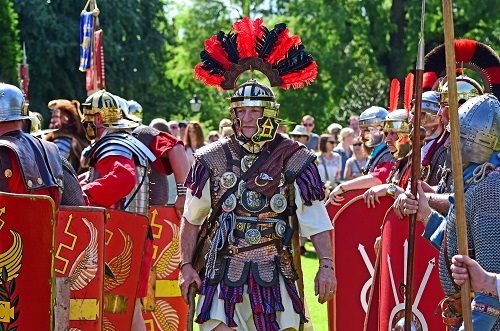 Click here and select ‘Eboracum Roman Festival’ in the categories section to view our family-friendly activities online. 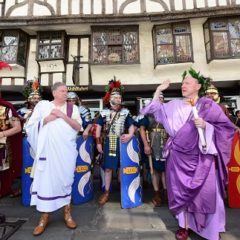 The Eboracum Roman Festival 2018 was dedicated to the memory of John Hampshire. His vision and generous bequest made this festival possible. 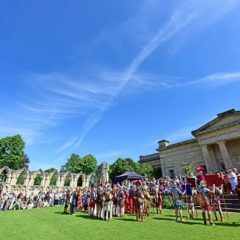 The festival was project led by York Museums Trust (charity number 1092466), with thanks to Roman Bath Museum, Roman Tours Ltd, Owl Adventures, The National Trust, Make it York, City of York Council and the University of York.